The world’s first Christian eating disorder resource & referral network! 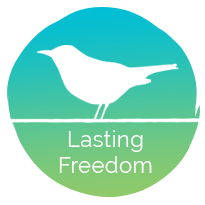 Lasting Freedom Online Support Program The world’s first Christian online support program for eating and body image issues. Featuring weekly webinars, online small group experiences and a private networking site for members, it is designed to help you learn and grow in the context of authentic community. Webinar guests include top experts, authors, and everyday people passionate about helping you grow physically, emotionally, intellectually, relationally, and spiritually. View calendar of speakers and membership information at www.findingbalance.com/support. New ID is a six-week Christian course being used by churches all over the world for those struggling with eating disorders. It brings the message that “freedom is possible.” Helmed by founder Kim Hemsley, a former disordered eater with a passion for seeing people set free, the course is intentional about leading you toward the freedom you seek. Watch a video featuring Kim, learn how to sign up and/or become a course leader at www.newid.org. Celebrate Recovery is a Christ-centered recovery program with meetings in most cities throughout the US. Based on a 12-step model, it features open groups as well as next-level “Steps” classes to get you out of isolation and plugged into a healing community. These groups are not necessarily “eating issues” groups, though some churches do make room for sub-types such as that. While we can’t speak to the type of experience you might receive for eating issues in particular, we do feel good about the overall foundation and structure of what happens in CR groups. Click here to access the Celebrate Recovery Group Locator page. Do you know of a support group/program that you think should be on this page? FINDINGbalance is not a treatment provider, and does not offer medical advice or diagnosis. The listing of programs and providers on this site is in no way verification of the quality or standards of the treatment provided. Please check and verify the credentials and therapy principles of any treatment provider listed here. FINDINGbalance, its staff, board, volunteers and any other affiliated members are not responsible for any undesirable experience arising out of your use of the information provided herein. Your use of this site constitutes your acceptance of these terms. While all contact requests are protected by the strictest confidentiality standards, for your privacy we recommend keeping your note brief and limiting confidential information until you have made a direct connection with the person you are contacting. Also, please note that some contact requests may take a few days to receive a response, depending on the schedule of the person you are contacting. If you or someone you care about are in crisis and need to talk with someone right away, please contact the NEDA hotline at (800) 931-2237 or call 911 if in the US.